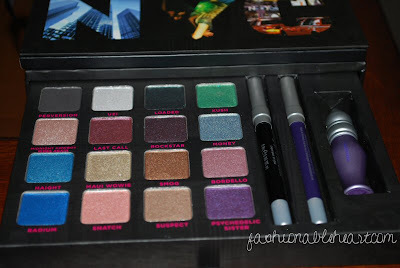 Here are my swatches of the Urban Decay Book of Shadows III. It is currently in stock at sephora.com and retails for $54US/$65CA. It is pretty steep in price, but the amount of product you are getting is well worth it. Seven of the sixteen eyeshadows are new colors, with Haight and Psychedelic Sister being two shades that are typically exclusive to Sephora. This is my first BOS, as I skipped out on the first and second ones only because they didn't really catch my eye. I feel like they spent a lot of time deciding on the color selection in this one and it really paid off. I am super excited to have a Rockstar eyeshadow to match my Rockstar eyeliner! My favorite shades in the palette would have to be: Rockstar, Money, Bordello, and Suspect. I recommend this. This palette is quite capable of both colorful and neutral looks! this is a gorgeous palette! i am definitely considering buying this, i just really want the naked palette! i am in LOVE with this palette!